A third of voters think Hillary Clinton has an "advantage" because she's a woman. What?! A Lot of Voters Think Hillary Has an “Advantage” Because She’s a Woman. This Election Is Nuts. 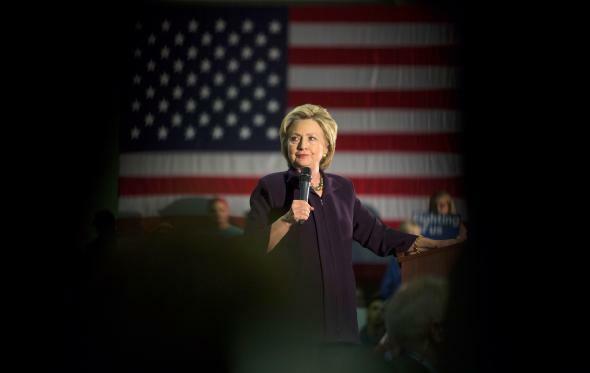 Hillary Clinton speaks at a campaign event at Camden County College on May 11 in Blackwood, New Jersey. Last month, Donald Trump stood on stage during one of his primary night victory press conferences and declared that the only thing Hillary Clinton had going for her is “the women’s card.” The now-presumptive GOP nominee continued: “If Hillary Clinton were a man, I don’t think she’d get 5 percent of the vote.” It was a remarkable statement even in the moment—one that would have been all the more gobsmacking if Trump hadn’t already dulled everyone’s senses with a year’s worth of bluster. It’s a comment worth revisiting in the wake of new polling that suggest a large swath of voters are buying what Trump is selling. According to the latest Washington Post/ABC News survey, 32 percent of registered voters said that Clinton is getting “more of an advantage in this election” because of her gender than Trump is because of his. (Another 33 percent saw no net-advantage for either candidate). Put another way, roughly 1 in 3 voters in a nation that has never elected a woman to its highest office in its 240-year history—and which was still denying the vote to women as recently as this past century—believes that Hillary has it easier because she’s a woman than Trump does because he’s a man. Um, really?! This specific survey asked about Trump and Clinton, not generic male and female candidates. So it’s possible some Americans are simply assuming Trump’s unapologetic misogyny will come back to bite him down the road and hand the election to Clinton in the process. But the fact that nearly two-thirds of those who saw her with an advantage because of gender told pollsters it was “unjustified” suggests something else is at play here. More importantly, the perception that voters’ views on female candidates isn’t something that Clinton has needed, and will continue to need to overcome doesn’t square with reality. For the better part of a century, Gallup has been trying to gauge Americans’ willingness to vote for a female candidate for president. When pollsters started asking the question back in the 1930s, only a third of respondents said they would be willing even “if she were qualified in every other respect.” Last year, that number was 92 percent. Progress? Sure. But the inverse of that number means that there are still 8 percent of Americans who aren’t only unwilling to vote for a female candidate no matter what, they’re willing to openly acknowledge it. It should not surprise you that Gallup doesn’t feel the need to bother itself with asking the same question about a hypothetical male candidate. Other historical data tells a similar story. The General Social Survey has been asking Americans for the past four decades whether they agree with the claim that “most men are better suited emotionally for politics than most women.” In 1974, 44 percent of respondents agreed. In 2014, 17 percent still did. The question of gender and politics in the 2016 race has a chicken-and-egg component. As the Post’s Janell Ross points out, the respondents in her paper’s survey broke down among some rather predictable lines: 46 percent of conservatives said Clinton was benefiting from a gender advantage, 41 percent of self-identified Republicans said the same, as did 38 percent of men and 34 percent of whites. * Meanwhile, 35 percent of liberals, 37 percent of self-identified Democrats, 36 percent of women, and 50 percent of blacks said Trump’s gender gave him the bigger edge. So it’s possible that some respondents are just giving their favored candidate the benefit of the doubt. It’s always easier for the competition, after all. But given what we know about gender equality in the real world—and what we’ve seen in this election already—it would be a mistake to dismiss this entirely as more partisan polarization. At the very least, it suggests Trump has found more fertile ground in his bid to rally skeptical supporters to his side in a contest against Hillary. Ultimately, it’s he who might be able to “play the gender card” to his advantage. *Correction, May 25, 2016: This post originally misspelled Janell Ross’ first name. *Correction, May 26, 2016: An earlier version of this post cited an Associated Press report suggesting EMILY’s List had advised Clinton to focus less on the historic nature of her campaign. That reference was removed after a spokeswoman for the group later clarified to Slate that the group’s report was an internal one shared with its fundraisers, and was not advising Clinton.